What started as a ‘MyStar International’, manufacturing motherboards in Taiwan and trying to penetrate the western markets – turned into a global leader in technology development and sales. Sales-wise, MSI is now more a force known for its gaming notebooks rather than motherboards, but the core business of motherboards and graphics cards is not showing any restrain. Titanium motherboards and Lightning graphics cards come with a lot of great features, and innovation is spreading throughout the company. One such example is recently announced collaboration between MSI, HTC and Valve, which went largely unnoticed (here’s a free hint – don’t put strategy announcements together with product announcements). Starting with CES 2016 product line-up, MSI with optimize its product lineup for Virtual Reality using SteamVR platform, which is (first) coming to market in the form of HTC Vive Pre. 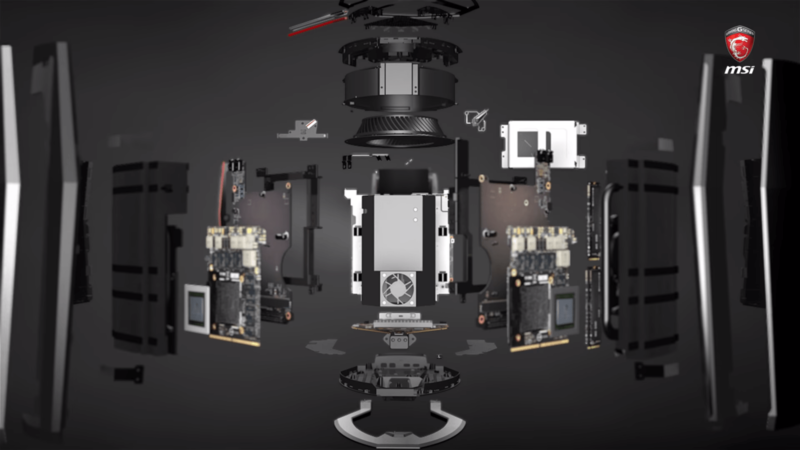 The very first VR-optimized product out of MSI is something we could describe as “Mac Pro for Gamers”. MSI took the concept, which was originally developed by Intel ‘for Apple’ – and supercharged it. While the name of ‘Vortex Gaming Tower’ leaves a lot to be desired (‘VR Vortex,’ ‘VR Tower’ or ‘VR PC’ would be simple, and effective), the compact 6.5 liter case packs a lot of punch. Intel Skylake-based Core i7 processor is paired with a lot of DDR4 memory and GeForce GTX 980 SLI (two graphics cards), which come in the same compact MXM factor we’ve known for years. Given the fantastic engineering effort NVIDIA made while making the GeForce 980M, desktop users won’t be deprived of performance – as both desktop and mobile cards use the same GPU. The inside of MSI Gaming Vortex PC. Vortex 360-degree cooling takes care of these few hundred watts (CPU is 90W + 330W for dual GTX 980) silently and efficiently, as the company claims 69 dB ambient noise. Price? $2,000 and up. Is this the ultimate VR gaming experience in a portable packaging, or will AMD’s Project Quantum become a reality and gain a foothold between now competing system integrators? Only Time will tell.